You don’t need to set aside time for it or plan how to execute it properly. It effortlessly arises and plays out until you shift your focus back to your responsibilities. Last week, I talked about getting more out of your expectations, and today I’m going to talk about a daily writing practice that helps you get more out of your daydreams. It only requires 15 minutes, and it doesn’t always have to be done at the same time. On your most productive days, it can positively impact your work, but it’s especially useful on days when you feel directionless or overwhelmed. And I’ll let you know what the glass of water is for, too. Now, this isn’t actually time to practice your writing. You won’t be journaling or brainstorming content ideas. 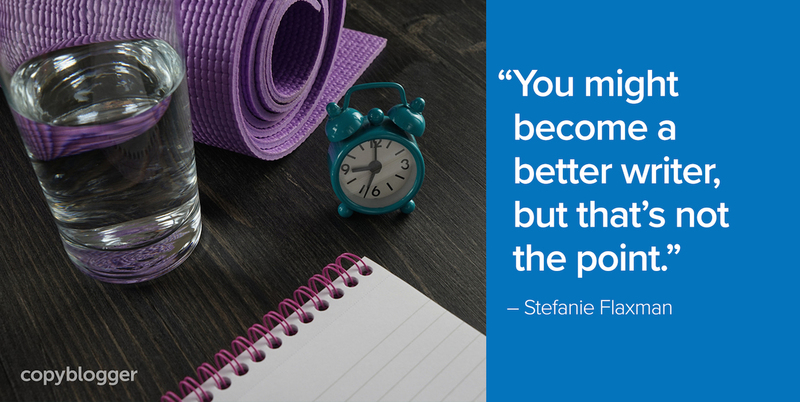 You might become a better writer over time, but that’s not the point. These 15 minutes are your time away from everything else you have going on. It’s a checkpoint for you to review your goals. It’s an outlet for ideas you don’t get to entertain during the rest of your day. We often get so caught up in doing everything we need to do that we don’t take time to reflect on whether or not all those actions are leading us to where we want to go. Should I change my priorities? Are there other options that would be better for me right now? Am I using my free time wisely? When you make it a habit to assess how you spend your time, it helps you pinpoint possible pitfalls. You can catch not-so-great ideas before you spend too much time on them and focus on better ones instead. If you’ve postponed working on something important, you could outline steps for starting your project. Scrutinizing your behavior as you evaluate your progress isn’t necessarily going to be helpful. I’ve modeled this practice after daydreaming so you can keep it light. Self-reflection is a great opportunity to celebrate your wins: What’s going well for you? Is there a way to build on your current successes? Without the pressure of meeting a word count or refining your writing voice, you’re free to expand on thoughts that aren’t typically priorities. Highlight a recent victory or two that will motivate you as you move forward. So: what don’t you have time to think about during the rest of the day? Chances are, your daily routine is already pretty full and you have interests that you never seem to get to work on. This writing session can be time to turn your daydream musings into concrete plans. Some days you might not have much to write about, but each writing session builds on the previous one. A couple words you jot down one day could spark a breakthrough later that week. When you slow down and sip the water over the 15-minute period, it’s a reminder that this short exercise enables you to optimize how you spend the majority of your time. How do you monitor your progress? Share your favorite practices in the comments below. Thanks, for the post. I write for five minutes at the park every morning before I start my daily exercise and, it seems to be some of the best writing because I am completely focused on just my thoughts. I tried doing this at the end of my day and I found that I was still in work mode and could not bring out the creative side as easily as I do in the morning. I’ll shoot for 15 minutes tomorrow and see how that works out. Such sound advice. Both hydrating and freeing of the mind. Personally, I write far more than 15 minutes a day because it’s what I do, but when it comes to writing in a journal, 15 minutes is a great aim for me. I tend to monitor my writing progress based on the number of words. This is the easiest way for me to measure it with both client projects and my own projects. With my journal writing, I keep a dream book, so I monitor my progress by using dots next to my goals showing I completed it for the day. I also re-read what I have written often to remind myself of where I was and where I am going. Thanks for sharing your tips, Benjamin! Okay. I can write more than 15 Minutes but when it comes to monitoring myself with my writing, it was a deal for me. While writing, I used to take breaks but it really disturbs the flow of writing which ultimately ruins the magic of reading for readers. But from now on, I will make myself prepare for that, of course with a glass of water. That was pretty good read. Thank you, Stefanie, for sharing it. Thank you for this wonderful article! I was about to start the practice of writing for 15 minutes a day. Definitely, am gonna push me to do the same. I’m a full-time copywriter, so I rarely have the time/energy to focus on my own creative writing. I may try to implement this into my [still-forming] morning routine or during my lunch break. Perhaps that will give me the push I need to do some of my own writing after the workday is complete. Thanks for the tip! What I enjoyed about this post is the emphasis placed on aspects around writing and not so much on the more spoken details of writing. When we do anything, it’s easy to get wrapped up in the task at hand or how we feel about it and things like that can take away from the goal of what we’re trying to do whether it’s about writing or any other goal at hand. And on the subject of fine tuning. Even more importantly the connection between water and clarity is something so understated and yet is so well received. I absolutely love the symbolism. When you’re intentional about the self reflection that is addressed in what you’ve written here, it isn’t just about the task of writing but in anything that we are investing our time in to as well. Yes, writing requires our attention but so does the preparation before we engage in the task, our attention while we’re engaged in that task and everything we do after it that is still ultimately connected to the writing that we do too. Sounds like a more productive form of free writing. I’ll try it on my commute and see if anything interesting pops up. These are amazing tips. I barely have a few minutes within the day to think about those that are not on my priority list. I think it’s time to actually put some daydreams into reality. I’ve been thinking a lot about eBook writing lately (before I go to bed) but have no idea where to start or what topic to focus on. This 15 minutes of clarity looks like the answer; the door to that opportunity I’ve always daydreamed. Thank you!